The City of Auburn’s Les Gove Park is a happening place for families! It’s located adjacent to the newly remodeled Auburn Library and is really a hub for city activities and recreation. The water spray park is very cool, and additions to Les Gove Park include new playground equipment (swings, rides, more), artificial turf that looks great year-round, and a large outdoor climbing wall on the Community Center nearby. 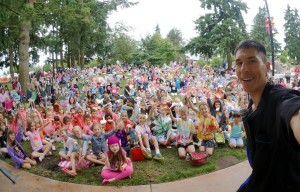 I performed magic as part of the Kids Summerstage Series hosted by the City of Auburn Parks, Arts, and Recreation. Read this and more recommendations on LinkedIn. Learn more about my magic shows for festivals and events online or send e-mail to jeff[at]amazementproductions.com or call me in Olympia toll-free (877) 412-5064. This entry was posted in Uncategorized and tagged Auburn, Auburn magician, community event, event, festival, festival magic, magic show, parks and recreation, Summerstage. Bookmark the permalink.